Another Afghanistan in the making? President Obama has aborted his planned military attack on Syria, but the proxy war that pits America and its allies against Russia is set to intensify in that critically located nation, with further horrific consequences for civilians and the likely proliferation of transnational terrorists. The proxy war injects greater volatility into the Arab world, where internal tumult risks recasting the entire Arab state system, centered on a series of artificial states created in the last century by departing colonial powers. The Washington-Moscow deal to strip Syria of its chemical arms will have little effect on the internal war there, one of the world’s bloodiest conflicts. This conflict has been fueled by Russian and Western arms supplies to rival sides. Indeed, Russia and the U.S.-British-French combination are determined to continue their 2-year-old proxy war in an already fractured Syria. Who cares for civilians? 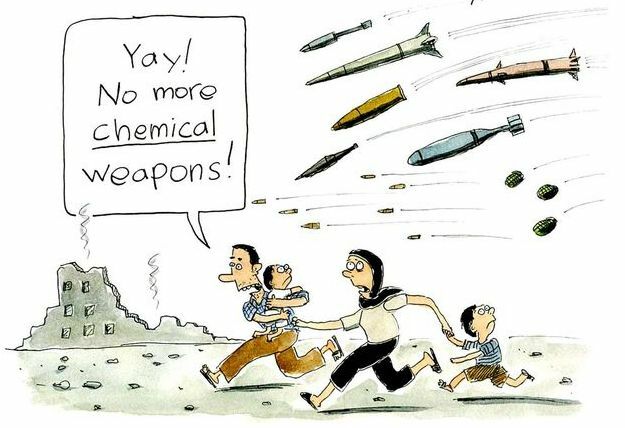 Most of the estimated 100,000 deaths in the Syrian violence have been caused by foreign-origin weapons, largely made in the proxy-war-waging countries that have shed crocodile tears over civilian deaths in an Aug. 21 sarin attack in suburban Damascus. The U.S. arms supply to rebels is primarily bankrolled by the oil sheikdoms. In this light, the key questions relate to Syria’s future: Will a new international-terrorist hub emerge that stretches across much of northern Syria and into the Sunni areas of Iraq? Will Syria’s fate be different from that of Afghanistan? The Syria issue is about more than just President Bashar Assad or chemical weapons: It is integral to the geopolitical clash between the Sunni Middle East, which remains under the U.S.-British-French sway, and the Shiite crescent stretching from Iran through Iraq, Syria and Lebanon to the Mediterranean Syrian port of Tartus, Russia’s only military base outside the former Soviet Union. With Russia emerging as a great-power patron in the Shiite crescent, the United States and the region’s two former colonial powers, Britain and France, are seeking to safeguard the regional geopolitical hegemony that they have enjoyed since the early 1970s, when Egypt switched sides. Over the decades, the United States has cemented close ties with Sunni Islamist rulers, including the cloistered Arab monarchs who fund Muslim extremist groups and madrassas overseas. Washington has already forgotten the main lesson from the Sept. 11, 2001, terrorist strikes — that it must focus on long-term strategic goals rather than short-term tactical victories. One reminder of that is President Obama’s current effort to strike a Faustian bargain with the thuggish Afghan Taliban. Since the 1990s, espousing military action as humanitarianism has been the common leitmotif uniting American neoconservatives and liberal interventionists — the hawks on the left who were most vocal recently in promoting a war against Syria. The serial interventionists have failed to take a good, hard look at the lessons of America’s past interventions. For example, those who took the United States to war in Libya have ignored how that “humanitarian” intervention has boomeranged, creating a lawless Islamist state affecting its neighbors’ security. In backing jihad against Mr. Assad’s autocratic rule, Mr. Obama’s policy has inadvertently strengthened the hands of radical Islamists. The CIA-aided, faction-ridden Free Syrian Army is in danger of being eclipsed by the pro-al Qaeda insurgent groups designated as terrorist organizations by the U.S. State Department — the al-Nusra Front and the Islamic State of Iraq and the Levant. The risk of an Iraq-style “soft” partition of Syria is high. Indeed, in a July 18 briefing, Mr. Obama’s spokesman, Jay Carney, declared that Mr. Assad “will never rule all of Syria again.” This was a reminder that the unstated goal of Mr. Obama’s military stalemate in Syria is an eventual partition, with Mr. Assad’s power confined to a rump Syria. As former National Security Adviser Zbigniew Brzezinski has acknowledged, “A stalemate is in our interest” — a Machiavellian scenario to lock regime and rebel forces in mutually debilitating combat. However, with jihadists already in control of much of northern Syria, the danger, as the CIA’s former deputy director, Michael J. Morell, has warned, is that an al Qaeda haven could emerge. This is exactly what happened earlier in Afghanistan as an unintended byproduct of America’s proxy war against the Soviet forces there. In fact, the transition from covert to overt aid to Syrian rebels by the CIA has occurred much faster than it did in the 1980s Afghanistan, although Syria has already become a magnet for foreign Sunni jihadists. As happened when the United States armed the Afghan mujahedeen, the CIA’s arms supply — far from winning loyal surrogates in Syria — is likely to end up empowering radical forces with transnational ties that extol and perpetrate violence as a religious tool. For some in Washington and for America’s regional allies — the petro-sheikdoms, Israel and Turkey — the proxy war in Syria is really part of a larger proxy war to contain Iran. The grinding proxy war in Syria thus promises to exact increasing costs regionally and internationally while allowing the U.S.-allied regional autocrats from Abu Dhabi to Ankara to step up their repression at home without fear of international censure. Russia, meanwhile, will continue to prop up the Assad regime. Given the increasingly murky geopolitics in spite of a rising tide of Syrian civilian displacement, suffering and death, Syria seems set to meet the fate of Afghanistan, a source of regional instability for more than a generation and where the United States is seeking to end its longest-ever military conflict, which has already cost it nearly $1 trillion dollars. Brahma Chellaney is a geostrategist and the author of “Water, Peace, and War” (Rowman & Littlefield Publishers, 2013).